The Model 1214 is a high quality single load cell scale designed to operate in harsh environments. The weighing platter and the indicator are stainless steel. The indicator is mounted on a 14" high stainless column with a adjustable bracket that allows the indicator to be tilted for the best viewing angle. 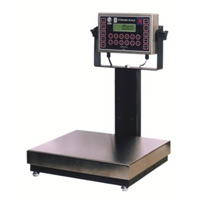 The 1214 can be furnished with a Model 800 weight indicator for general weighing or an ModelÂ 810 weight indicator which has more features for special applications. Both models have RS232 output, a counting mode and can display pounds, Kgs. or grams.